Handling Tips: 36-40°F. Keep cold. May mist occasionally. General Information: A bean, sometimes referred to as an Italian flat bean, that can eaten as a snap bean when it is very young or as a dried bean during later stages of maturity. 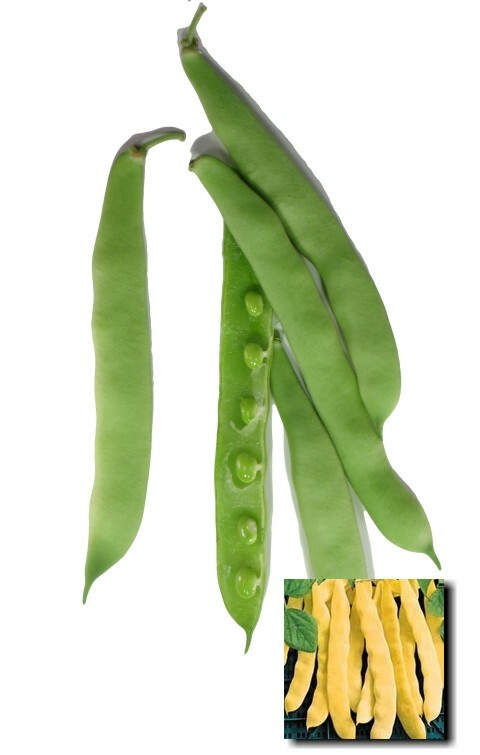 When eaten as a snap bean it may be grown as a green, purple or yellow colored bean and is similar to a common green snap bean, except that it has a broader and flatter pod rather than a cylindrical pod. This bean is 4-7" long and the entire pod is edible. Applications: They can be eaten raw, eaten as a side dish, or added as an ingredient to other dishes, providing a sweet buttery flavor. The entire pod is edible. Do not overcook this bean, as this may cause it to become soft and mushy. As a dried bean the Romano bean becomes a good ingredient for a variety of bean dishes, soups, chili, and salads.